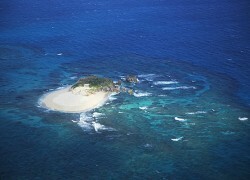 Komaka Island is a small, uninhabited island ringed by beautiful white sand beaches and having a circumference of only 800 meters. The island is crowded with people who enjoy sea-bathing, diving, snorkeling and beach parties. You can see many colorful tropical fish swimming in the shallow waters near the beaches. In summer, you can enjoy camping under a star-studded sky. The only facility available on the island is a toilet. When visiting the island, don't forget to bring your own food, drinks and items such as beach umbrellas.